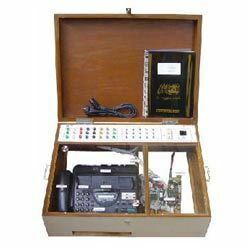 We are among the trusted manufacturers & suppliers of a wide range of Communication Lab Apparatus. These instruments are manufactured using optimum quality raw material, which is obtained from certified vendors. Our products are known for their trouble-free performance, low maintenance, easy installation and durability. We manufacture these products in line with the global quality standards and norms. Our clients can avail these products at competitive prices in the market. * Demonstrates the principle and working of a Frequency Division Demultiplexing. * Supply required 230V, 50Hz AC. * Observation of the output in the CRO. * Test points are provided at various stages in the circuit to observe the waveforms and voltages. 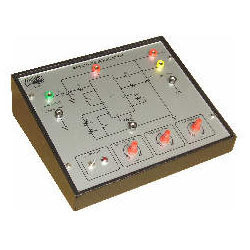 * Housed in an elegant cabinet with a well spread intelligently designed circuit layout on the front panel. * Strongly supported by a comprehensive instruction manual completely with theory and operation details. With the aid of latest machinery and experience manpower, we offer our patrons with the best quality of Amplitude Modulation Board. Known for its ease of operation, the offered amplitude modulation board demonstrates the principle of amplitude modulation. Before dispatch at the patrons’ end, the offered board is packed with standardized packaging. Demonstrates the principle of Amplitude Modulation. Supply required 230V, 50Hz AC. Built - in IC based DC regulated power supply with short circuit protection and LED indication for supply “ON”. Built - in carrier signal generator with Amplitude adjust, frequency adjust, and waveform adjust potentiometer on the front panel. Facility for connecting external modulating signal. Observation of Amplitude Modulated signal at the output on CRO. Observation of amplitude modulated waveforms for different modulation depths. Housed in an elegant cabinet with a well spread intelligently designed circuit layout on the front panel. As a leader of this domain, we offer the optimum quality of Delta Modulation and Demodulation Trainer. 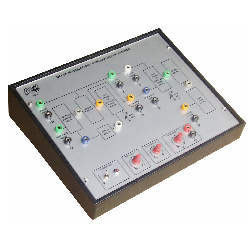 Rendered by us at cost effective prices, the offered delta modulation and demodulation trainer is designed as per the industry laid norms. Due to its high functionality and low maintenance, the offered trainer is highly appreciated among our patrons. Demonstrates the Principle and Working of Delta Modulation and Demodulation. Supply required 230V, 50 Hz AC. Built-in IC based power supply with short circuit protection and LED indication for supply “ON”. 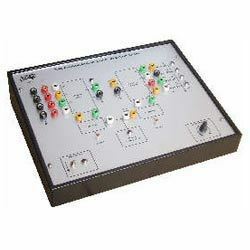 Modulating circuit consists of amplifier, variable sampling rate generator, Multiplexer, Integrator and Comparator. Observation of modulated signal on CRO. Built - in Delta Demodulation circuit using a Low Pass Filter and an Integrator. Delta modulated signal to be provided externally for which connecting facility provided on board. Set of required number of patch cords. Owing to our rich experience of this domain, we have been able to manufacture and supply the optimum quality of Automatic Gain Control Board. 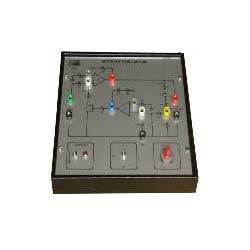 The offered gain control board is appreciated for its fully automated operation. Being a quality focused name, we assure that the quality of the offered board is never compromised. With the aid of latest machinery, we manufacture the best quality of Fax Demonstrator. Rendered by us at cost effective prices, the offered demonstrator demonstrate the working of various fax machine. Motivated to ensure high standards of quality, the offered fax demonstrator is rigorously checked by our team of experts. Demonstrates the working principle of fax machine. Complete block diagram is given on the front panel. Fault creating facility for ten regular and common faults is provided. All advance functions like programming / setting address, date, logo, timing the fax and many other features are provided. Availability of immediate status and error report. Remote activation by second phone to switch machine to fax mode. Polling facility for document retrieval from unattended fax machine is provided. Control of resolution for transmission of document. 4 built in speaker for handset - free dialing and call progress monitoring. Facility to take copies of documents. Housed in an elegant cabinet with a well spread intelligently designed layout with transparent acrylic sheets on both the top and bottom for dust proof viewing of the circuitry and mechanism. Strongly supported by a comprehensive instruction manual completely with theory and operation details. Demonstrates the principle and working of a time division multiplexing and demultiplexing circuit. Built-in ic based dc regulated power supply with short circuit protection and led indication for supply “on”. Transmission of several separate information channels in the same communication circuit simultaneously and without interference. Study of 4 channel tdm generator using pulse duration modulation. 4 observation of the output in the cro. 4 receiving or demultiplexing of several separate information channels in the same communication circuit simultaneously and without interference. Study of 4 channel time division demultiplexing. 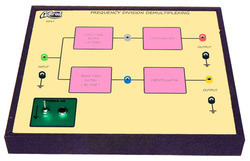 Analog / digital signals can be obtained at any of the 4 channels. 4 multi - coloured test points are provided at various stages in the circuit to observe the waveforms and voltages. Looking for Communication Lab Apparatus ?